The month of March in an Instagram- nutshell. Not much this month, probably because to me at least the month flew by even quicker than february. This month I attended a wedding, a farewell lunch, did some serious shopping, had amazing breakfast and baked a bunch of seriously chocolate-y cookies. Follow my instagram for more insight into my life. Der Monat März in Instagram-Form. Nicht viele Bilder sind diesen Monat enstanden, wahrscheinlich weil der März noch schneller an mir vorbeizog als der Februar. Diesen Monat war ich auf einer Hochzeit, einem Abschieds-Lunch, hab ziemlich viel geshoppt, hatte wunderbar leckeres Frühstück und habe richtig schokoladige Kekse alle Vivianna does Make Up gebacken. Folgt meinem Instagram-Account für mehr Einsicht in mein Leben. 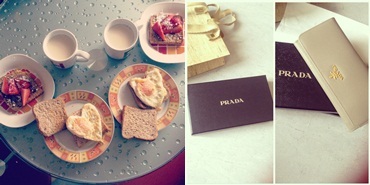 Love your prada, nice pictures! 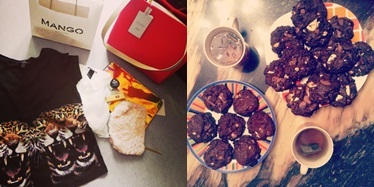 Those cookies look delish, although I've had so much chocolate over this Easter weekend! Beautiful! Love all of your photos! 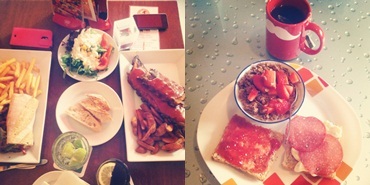 The food looks so yummy. Love the heart shaped toast. Thanks for posting the photos and feel free to drop by me too when you have time. woooww fancy wallet- if i ever owned anything designer i'd covet it haha. and that heart french toast is so adorable! and i completely agree with you- this month zoomed by! dein prada portemonnaie ist soooo wunderschön. Mm, all your food photographs look so tasty. I need to try out those cookies! That lil batman outfit is sooo cute! OMG!!!! Stunning picrures!! 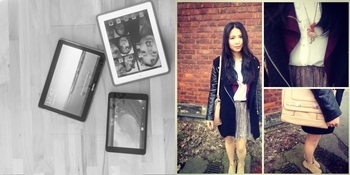 Would you like to follow each other via bloglovin and facebook? such a beautiful photos! You're really so pretty!